Specializing in CNC Mill and Lathe work, Maxpol Precision Machining offers both short run prototype and higher volume production runs. Our investment in latest technology guarantees product accuracy and prompt delivery. For more than 20 years, we have provided high quality machining services to defense, aircraft, computers, semiconductor, telecommunication, automotive-racing and medical industries. 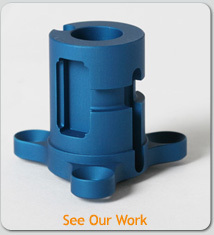 We can machine parts from almost any material, from prototype to production quantities.